The RhinoFire professional firework sequencer is a rugged sequencer designed to create amazing timed fireworks and special effects. Examples include chases, sweeps, aircraft bullet hits or any pyrotechnic effect that needs precise timing. 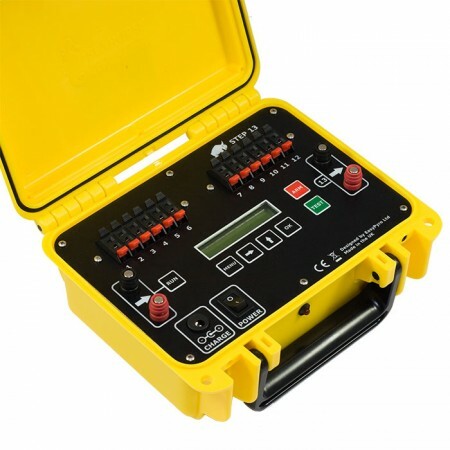 The firework sequencer is an ideal addition to an existing firing system. Alternatively it can be used as a stand alone device, or in combination with hand lit fireworks. It can also be started using the Trigger Unit or connecting it to any other firework firing system. The sequencer is a professional, rugged device while remaining extremely simple to program and use. Check out some great customer testimonials or read an independent review. Step to the next cue on each trigger input pulse. Set the same time interval between all cues. Set a different interval between cues. Set any cue to fire at any time according to an internal clock. Fire sweeps / chases back and forth across multiple units. Easily Save, Recall and Edit 10 shows in each mode. Connect multiple units together in any mode (watch the video). Extremely strong and rugged (read the reviews and watch the video). Lid can be closed on e-match / igniter wires. Internal 12v Lead Acid rechargeable battery. 12v @ 6 Amp output per output. Fire 12 e-matches in series or parallel per cue. International fast charger supplied (UK, EURO, USA). Full Self Test and Diagnostic for maximum safety and reliability. Set time intervals from 10ms (0.01s) to 9m59.99s. Battery meter (voltage and %). 3 - 30v trigger input pulse (compatible with almost any firing system or battery).